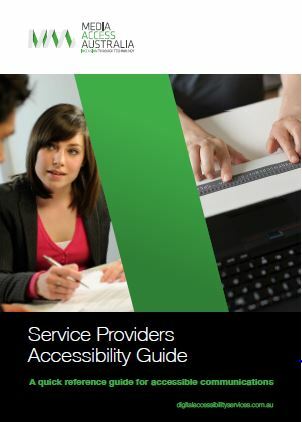 Service Providers Accessibility Guide Guide is designed around the needs of service providers who deliver support to participants in the National Disability Insurance Scheme, it works equally well for those organisations that want to ensure that their communications and content are accessible to people with a disability. 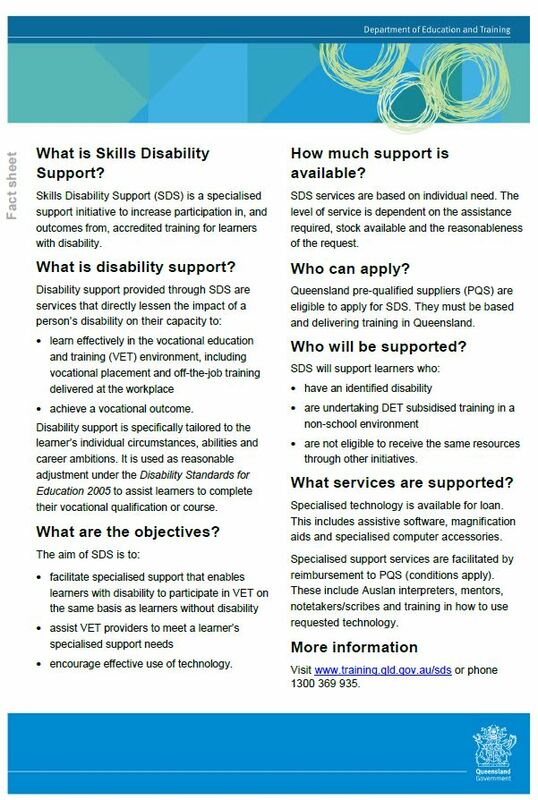 Skills Disability Support Factsheet Qld Government An overview of equipment and supports available for Pre Qualified Supplier. JobAccess JobAccess is here to help people with disability find and keep jobs, get promoted to better jobs, upgrade or expand their workplace skills, and more. 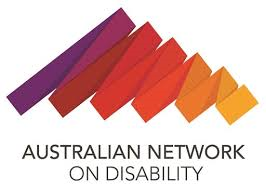 Australian Network on Disability The Australian Network on Disability (AND) is a national, membership based, for-purpose organisation that supports organisations to advance the inclusion of people with disability in all aspects of business. AND runs programs for university students that helps them find paid internships, and providers student mentoring. 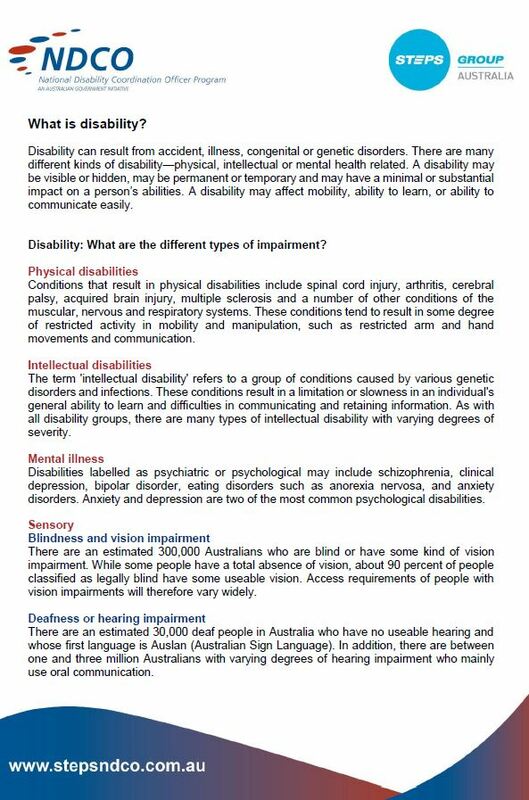 Disability Awareness Training This training is free, created by the NDCO Program and now being curated by the Australian Disability Clearinghouse on Education and Training. 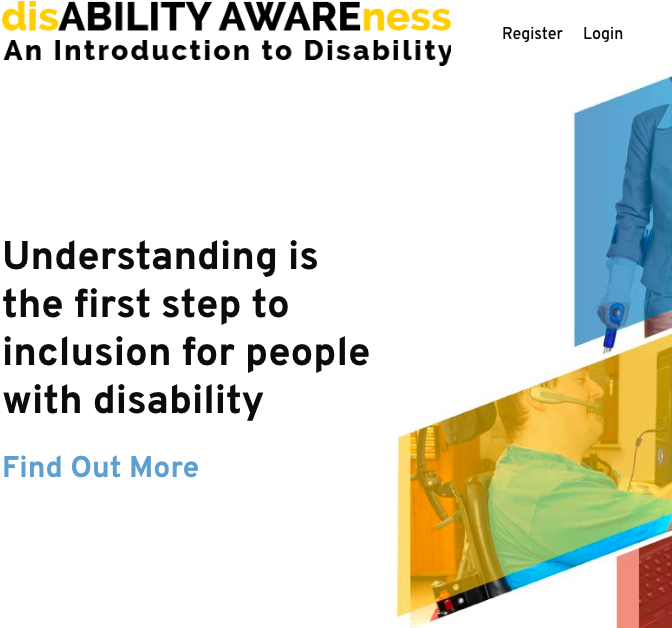 A great starter awareness training for people and organisations wanting to develop a basic level of awareness and inclusivity for people with disability, this course can provide you and your colleagues with certificates of completion. University Specialist Employment Partnership USEP is an NDCO led project that works with Universities, Disability Employment Service providers and employers to improve graduate success (employment) for university students with disability. This project is in action at James Cook University, Griffith University, University of Tasmania and Wollongong University. 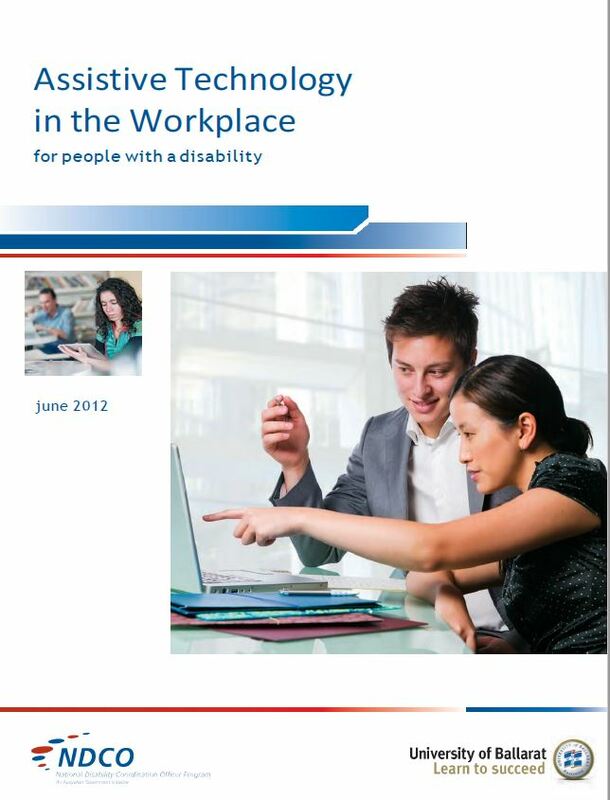 Assistive Technology in the Workplace This booklet provides information about technology that can be used in the workplace by people with a disability. 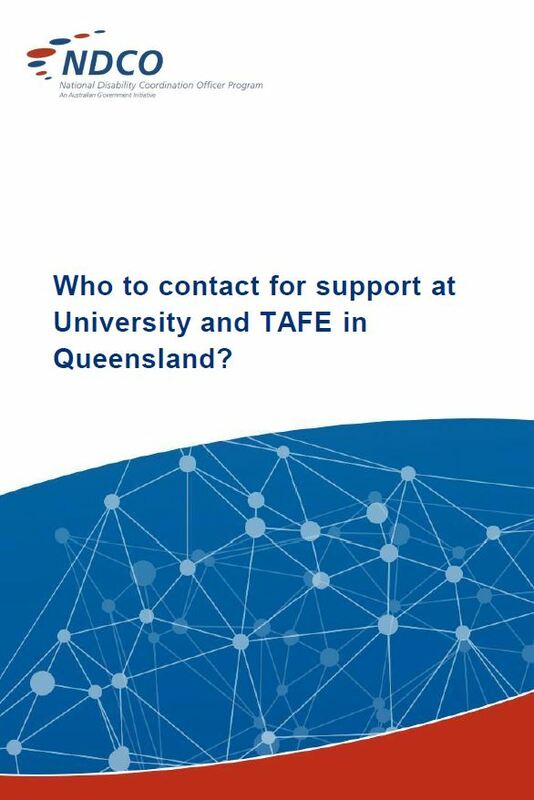 Disability Contacts Queensland TAFE & University 2018 list of contacts in TAFE and University to support students with disability. Created by Brisbane NDCO. 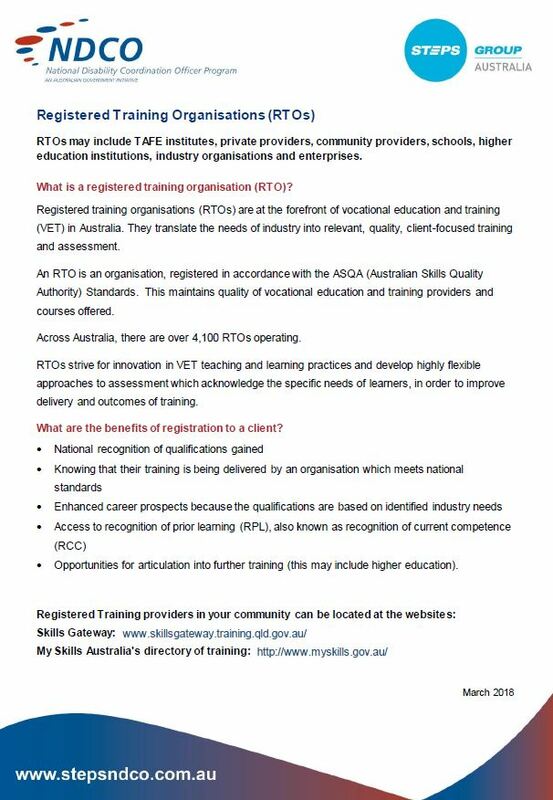 Registered Training Organisations – Access & Equity An overview of what RTOs provide students with disability. What are Registered Training Organisations? Provides an overview of what services and supports are provided by Registered Training Organisations (RTOs). Reasonable Adjustments Provides examples of how reasonable adjustments could be implemented in post school education and training. 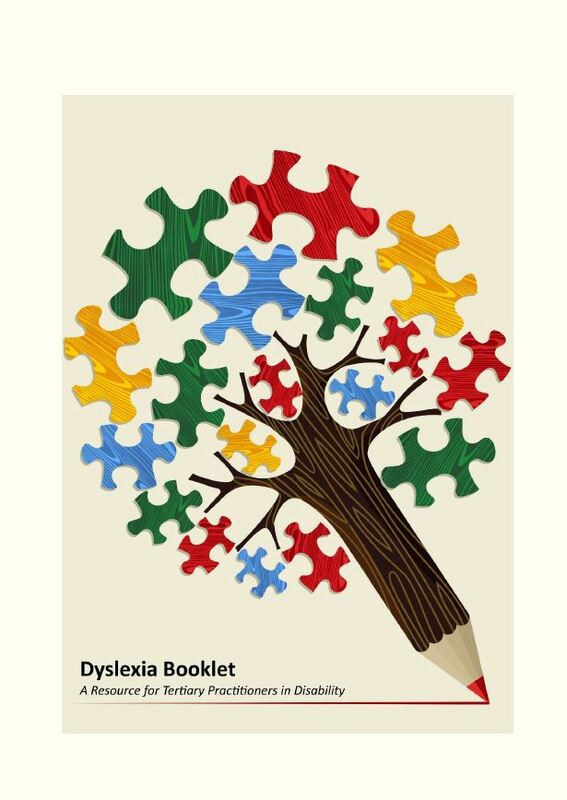 Dyslexia Resource Guide This booklet covers planning and implementing reasonable adjustments for students with dyslexia, including assistive technology. It contains ideas around reasonable adjustments, case studies and further information and resources. Love Apptually – Apps to support learning Created by Qld Government. It assists VET practitioners and learners to select applications (apps) for mobile devices that support teaching and learning. 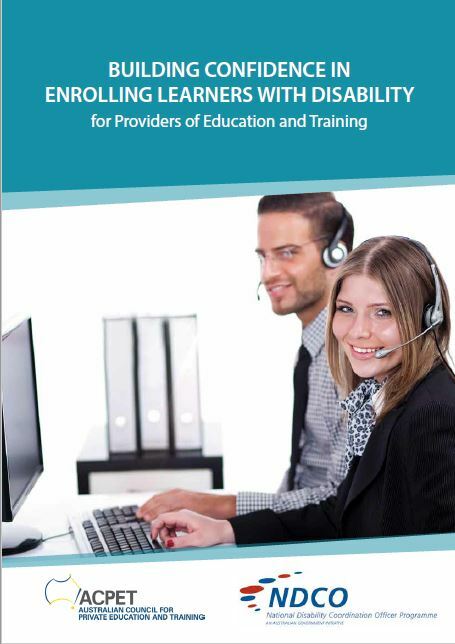 Building Confidence in Enrolling Learners with Disability This guide is for small to medium education and training providers who deliver both Vocational Education and Training as well as Higher Education qualifications. It aims to assist training providers to feel more confident in supporting students with disability through the determination of training pathways, course selection, enrolment, and individual education planning. 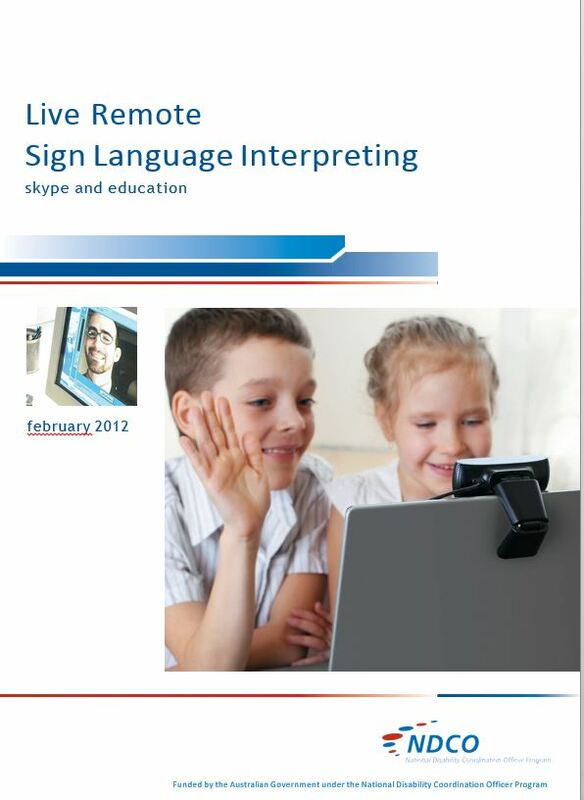 NDCO Auslan Skype Education Booklet This information is aimed at creating awareness of the use of Skype for accessing sign language interpreters for deaf students and their teachers in education. 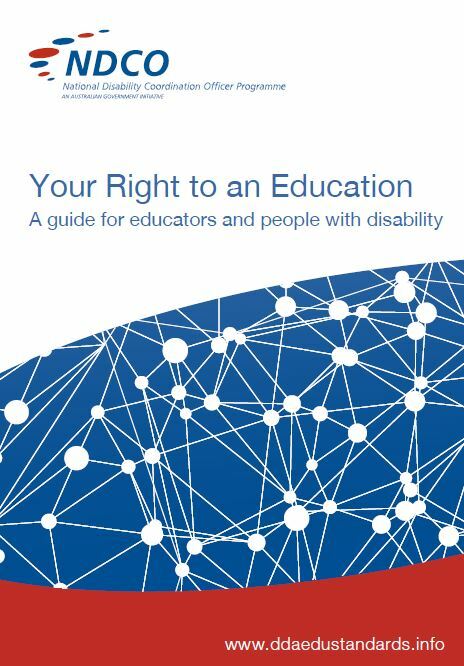 Your Right to an Education – DDA Standards An overview of the DDA standards 2005. 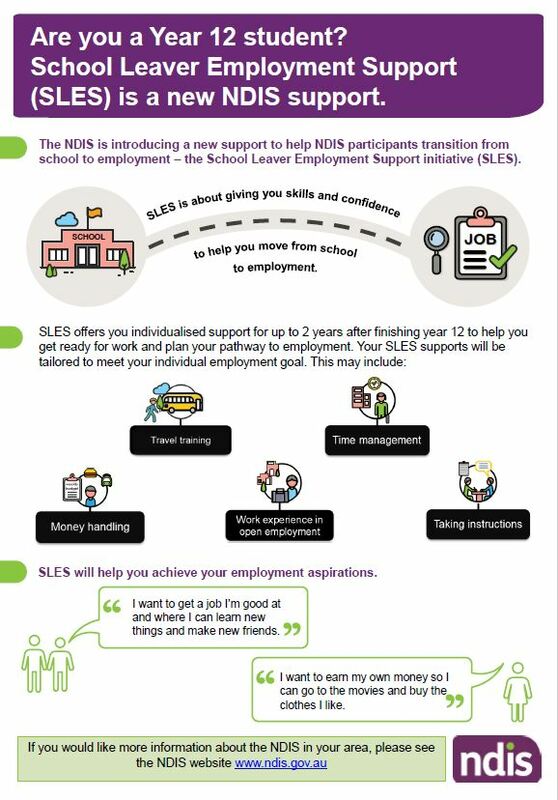 Queensland Government: Skills Disability Support Service Skills Disability Support: provides specialist technology and support services to pre-qualified suppliers. Australian Disability Clearinghouse on Education & Training ADCET provides information, advice and resources to disability practitioners, academics, teachers and students on inclusive practices within the post-secondary education sector. Guidelines for Accessible Instructional Media This guide provides an overview of some of the accessibility issues that confront many students. 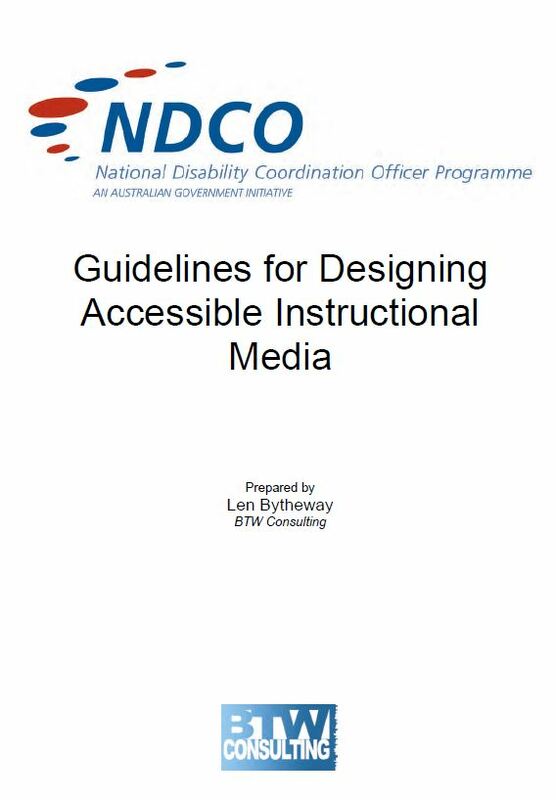 It includes a guide to producing or modifying educational media to improve access for all students, especially those with sensory disabilities. Create Your Future This is a series of films that contain personal stories of people with disability in study and work – created by National Disability Coordination Officers in New South Wales. 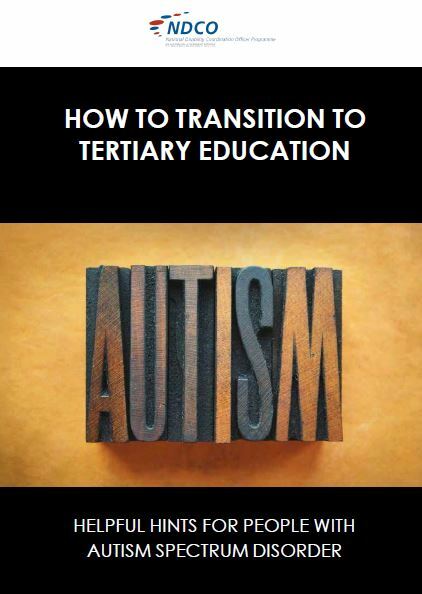 How to Transition to Tertiary Education: Helpful hints for people with Autism Spectrum Disorder A specific resource for people on the autism spectrum discussing strategies and tips for transitions into studying at the tertiary level. This book covers what changes might be expected but is not able to predict all possible changes you may experience. The aim of the resource is to work toward a good logical approach to planning which will create a smooth transition into further study. 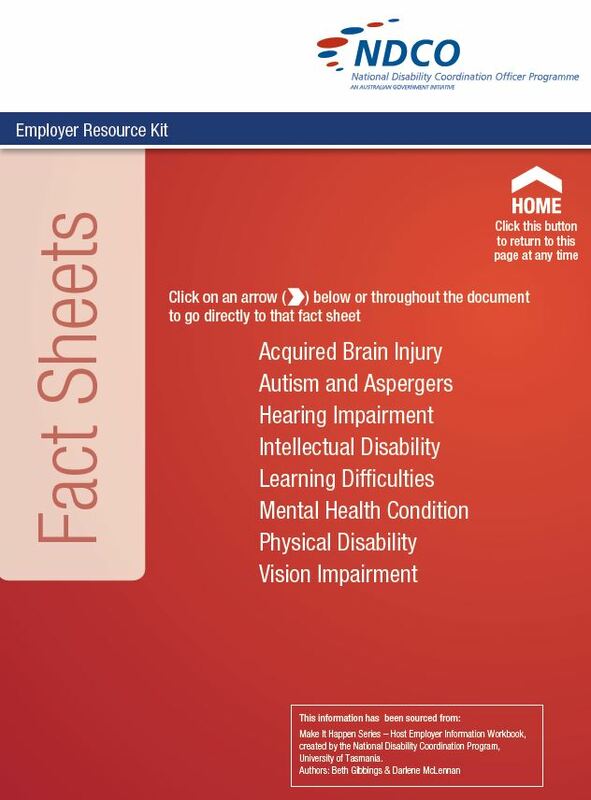 Disability Fact Sheets Interactive fact sheets highlighting specific disabilities and accommodation strategies. 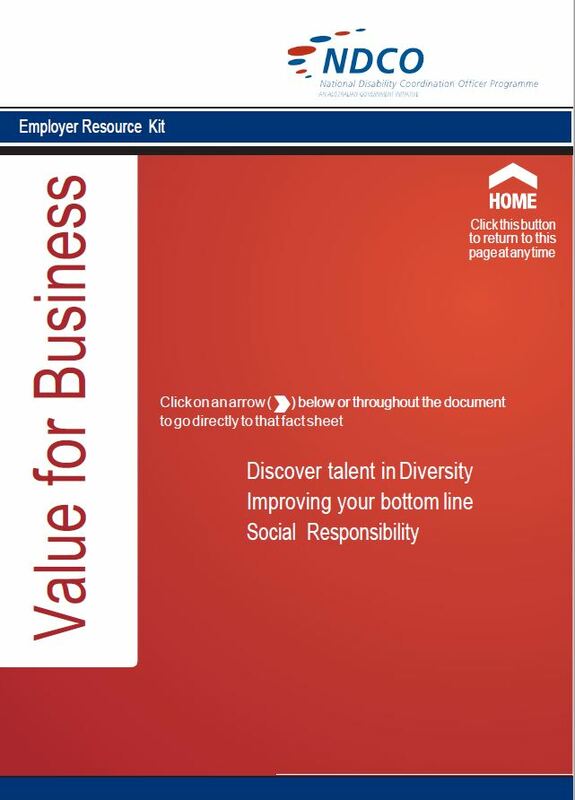 Value for Business Interactive factsheet highlighting diversity, social responsibility and improving businesses bottom line. 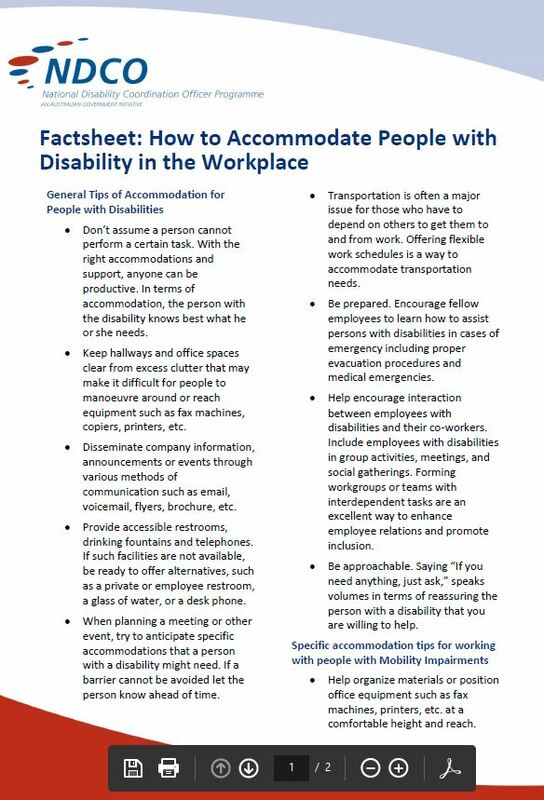 How to Accommodate People with Disability in the Workplace General Tips on how to accomodate people with disability in the workplace. What are the Different Types of Disability? Disability: What are the different types of disability? This resource provides a brief overview about Physical, Intellectual, Mental, Sensory, Learning, ASD & Health conditions. Benefits of Employing Someone with Autism. Daisy’s story A personal story from Daisy on what it is like to live with Autism and what she would like to be provided in the workplace to help accommodate her. Employer Useful Links Add to your diverse workforce and build your business. These links may be useful. Disclosure: It’s a Personal Decision This resource addresses the challenges people with disability can experience when studying or in the workplace, and discusses options and pathways to sharing personal information. Created & maintained by NDCO Western Sydney. 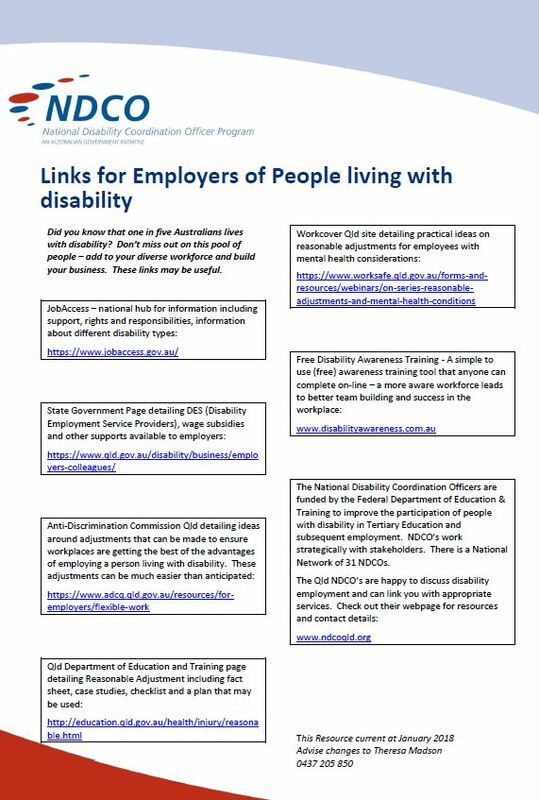 Education to Employment This toolkit has been designed for graduates with disability as well as employment and career services with options, tips and ideas about increasing employment and employability. National Training Complaints Hotline Is an initiative between the Commonwealth, State and Territory Governments. You are able to report a complaint and have it referred to the right authority for consideration. 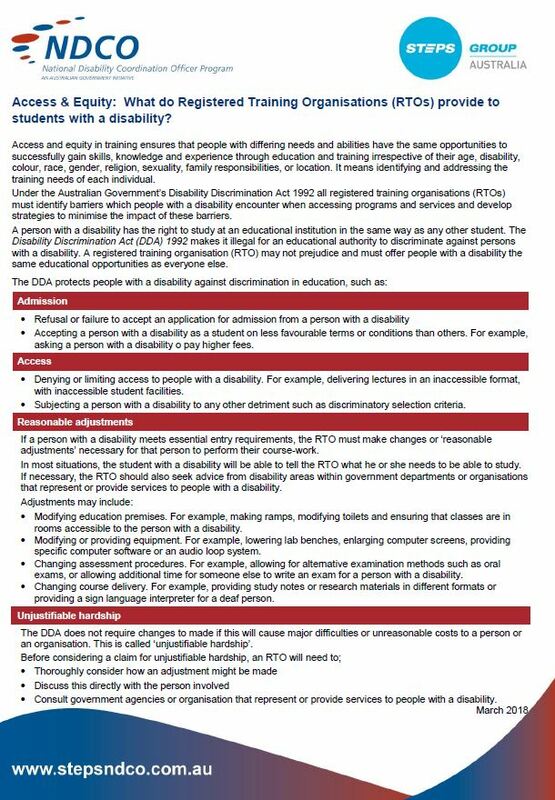 Australian Human Rights Commission: A guide for the Tertiary Sector This site will enable you to develop a Disability Discrimination Action Plan for your education and training institution. Australian Human Rights Commission: A guide for Business This site will enable you to develop a Disability Discrimination Action Plan for your business. 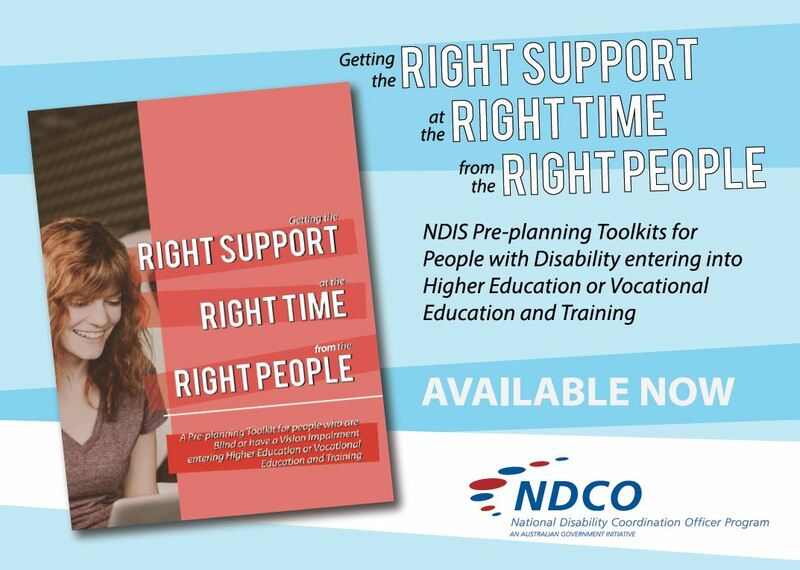 NDIS Pre-Planning for People with Disability entering into Tertiary Education or VET This is an NDIS Pre Planning Toolkit for people with disability who are entering into Higher Education or Vocational Education and Training. The resource has specific modules for different types of disability, discussing structuring supports and accessing supports at the right time, in the right place. 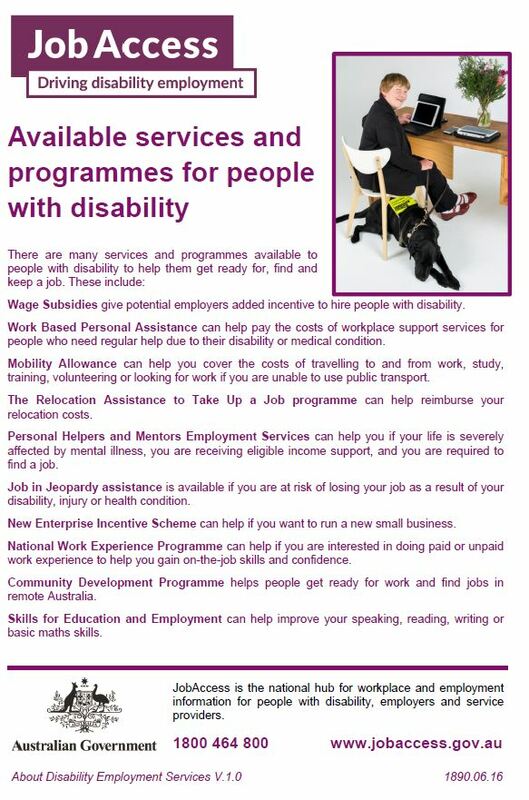 Available Services and Programs for People with Disability Looking for Work JobAccess flyer on the many services and programs available to people with disability to help them get ready for, find and keep a job. 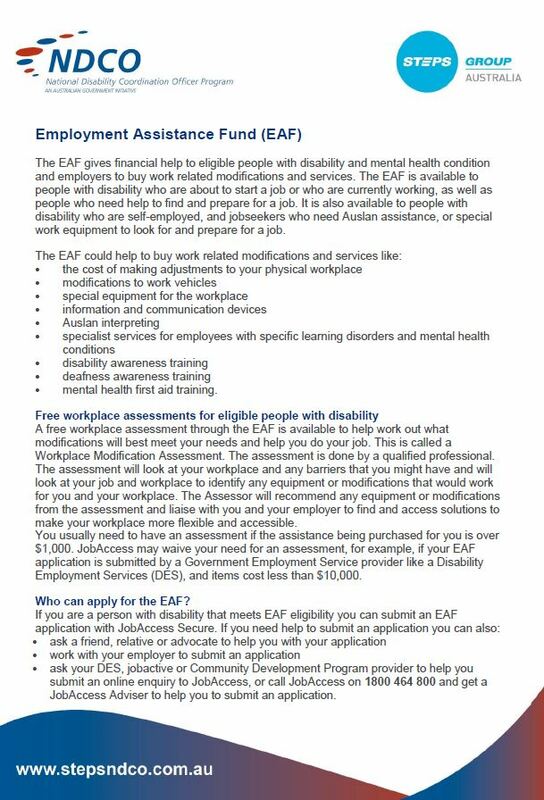 Employment Assistance Fund Overview The EAF gives financial help to eligible people with disability and mental health condition and employers to buy work related modifications and services. The EAF is available to people with disability who are about to start a job or who are currently working, as well as people who need help to find and prepare for a job. 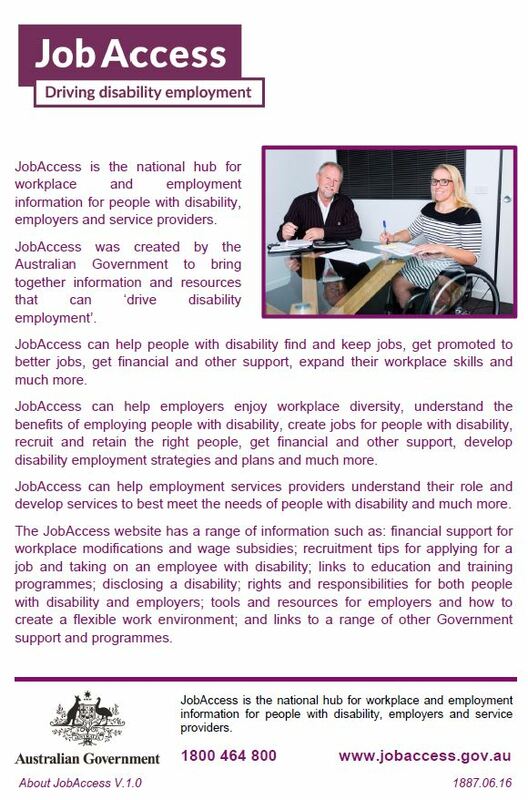 JobAccess Factsheet JobAccess is the national hub for workplace and employment information for people with disability, employers and service providers. 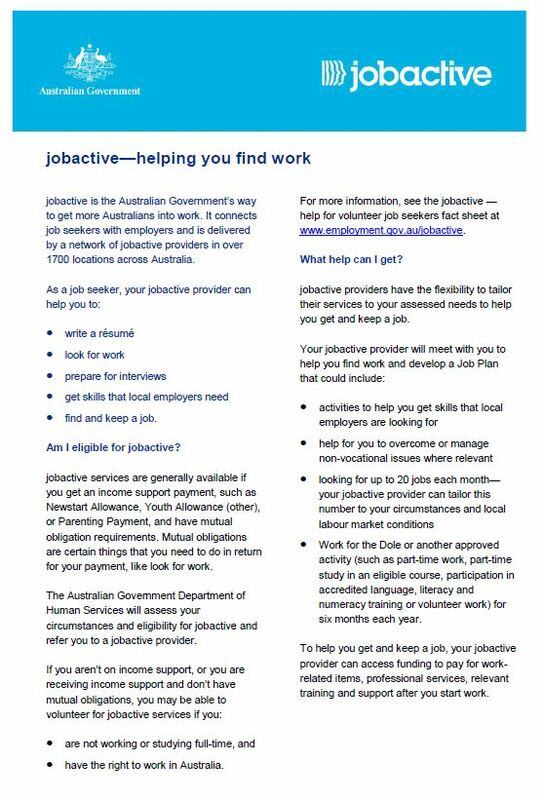 jobactive Overview jobactive is the Australian Government’s way to get more Australians into work. It connects job seekers with employers. 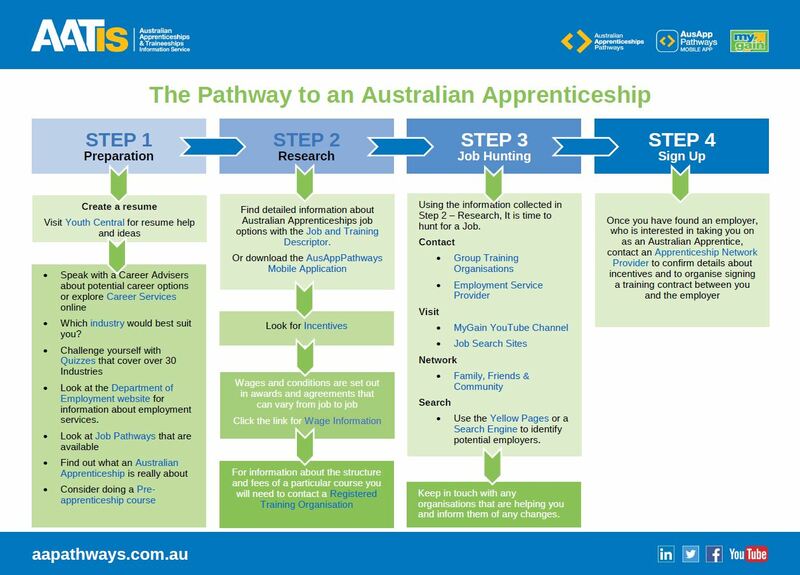 Pathway to an Australian Apprenticeship The pathway to an Australian Apprenticeship from Australian Apprenticeships and Traineeships Information Service. 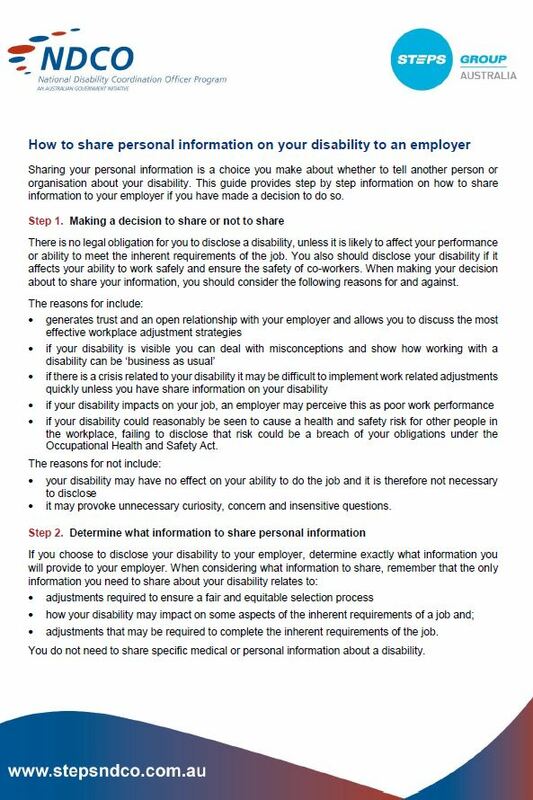 Disclosure: Sharing Personal Information Telling people or employers about your disability is your choice. This guide provides step by step information on how to share information to your employer if you have made a decision to do so. 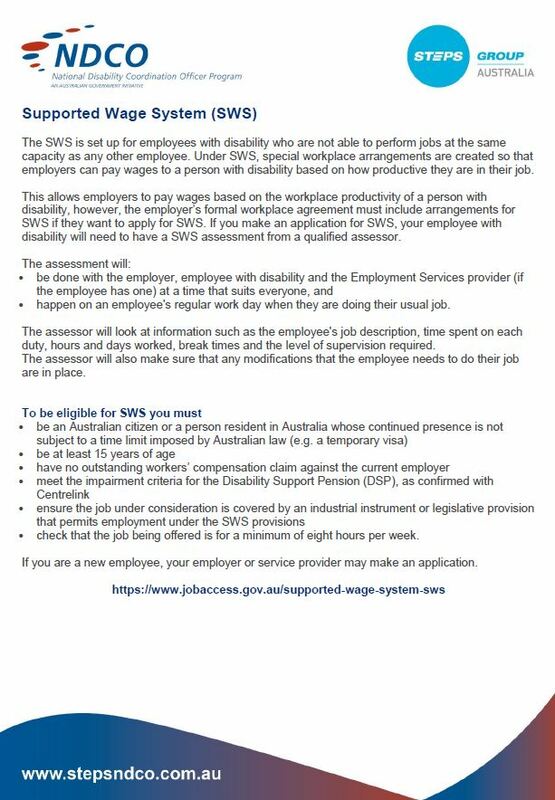 Supported Wage System Overview The SWS is set up for employees with disability who are not able to perform jobs at the same capacity as any other employee. Under SWS, special workplace arrangements are created so that employers can pay wages to a person with disability based on how productive they are in their job. 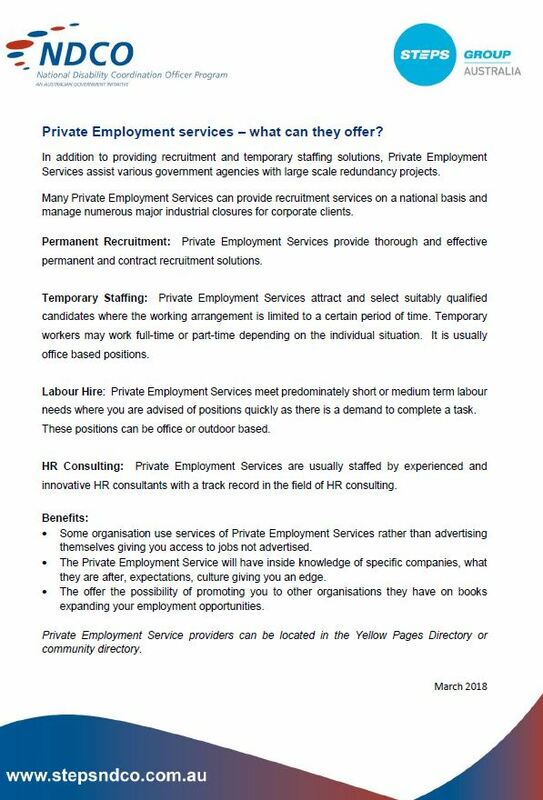 What do Private Employment Services Provide? In addition to providing recruitment and temporary staffing solutions, private employment services assist various government agencies with large scale redundancy projects. 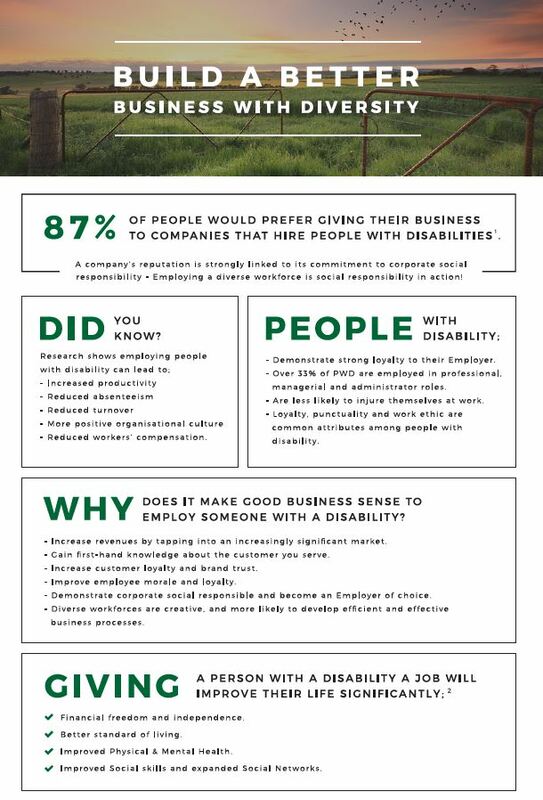 Disability Employment Services (DES) Disability Employment Services (DES) help people with disability, injury or health condition to prepare for, find and secure employment. Australian Apprenticeship Support Network This government site provides information on Australian apprenticeships including support and advice for people who have started an apprenticeship or looking to begin, FAQ and useful links. Australian Apprenticeships Pathways The Australian Apprenticeships & Traineeships Information Service – information for people considering career options, employers looking at recruitment and those providing support and advice. Queensland Government: Apprenticeship Info Website providing a range of information on Apprenticeships and Traineeships in Queensland including: being an apprentice; eligibility, funding available and a comprehensive section for employers. Sharing Personal Information with an Employer Video Short vignette by USQ students on the benefits of sharing personal information with an employer. 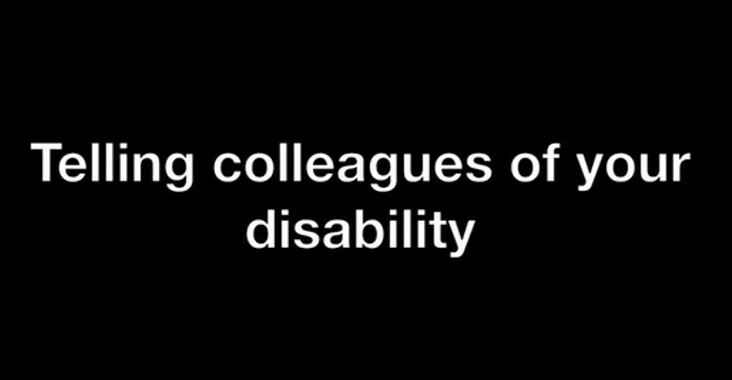 Telling your Work Colleagues about your Disability Video Short vignette from USQ students around telling work colleagues of your disability. JobOutlook: Explore Your Career Options Australian Government website highlights daily tasks, skills needs, pathways and prospects for careers you can aim for now or in the future. First In Family This website is designed for current and intending university students who are the first in their immediate family to go to university, as well as for their families and for all those who work within the higher education sector. You to Uni This site has been developed to help adult learners in Queensland, who are looking to do further study, understand their options and make informed decisions. Training consumer tips Queensland Government website: Prospective vocational education and training (VET) students should view themselves as consumers of training services. Like any other significant purchase, individuals should do their research. The training consumer tips are intended for people looking to undertake accredited training leading to a nationally recognised qualification such as a Certificate III or Diploma. 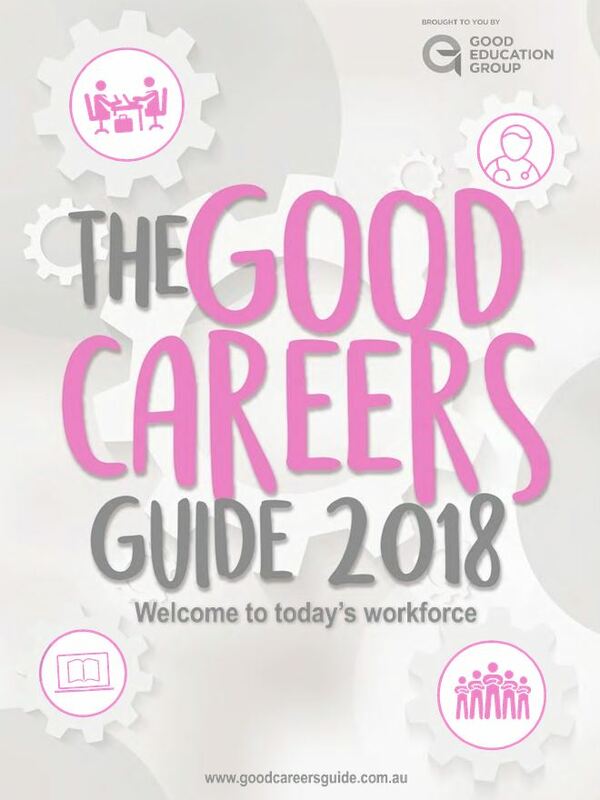 The Good Careers Guide 2018 Provides a look at the range of occupations, education and training pathways, and information to help you work out what occupation suites you best based on your interests and abilities. 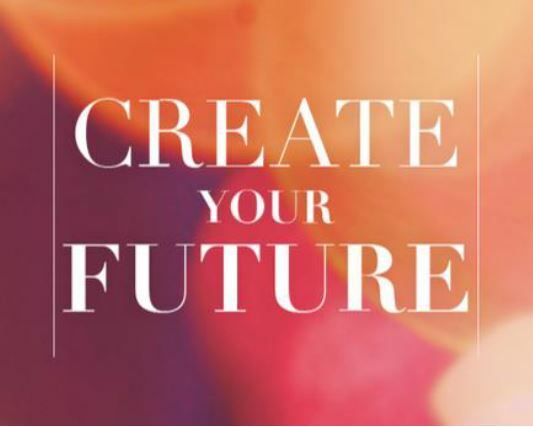 MyFuture Shape your Future Create a profile to start your personal career journey. Identify your interests, build your career profile and explore occupations. Complete quizzes and make the right career decisions for you include training information. Fair Work Ombusman We’re here to help you understand your rights and responsibilities at work. If you’ve got a question about workplace entitlements, you’ve come to the right website. We work with employees, employers and the community to educate and encourage compliance with Australia’s workplace laws. 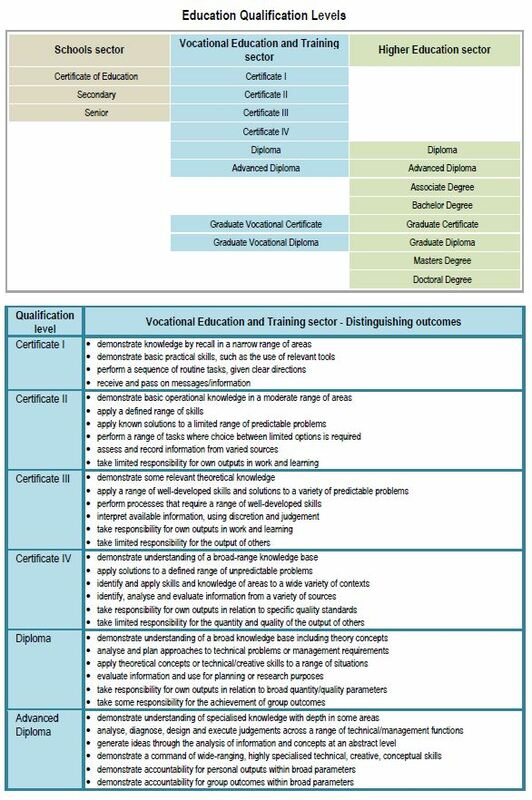 Qualification Levels An overview of post school education and training qualifications. 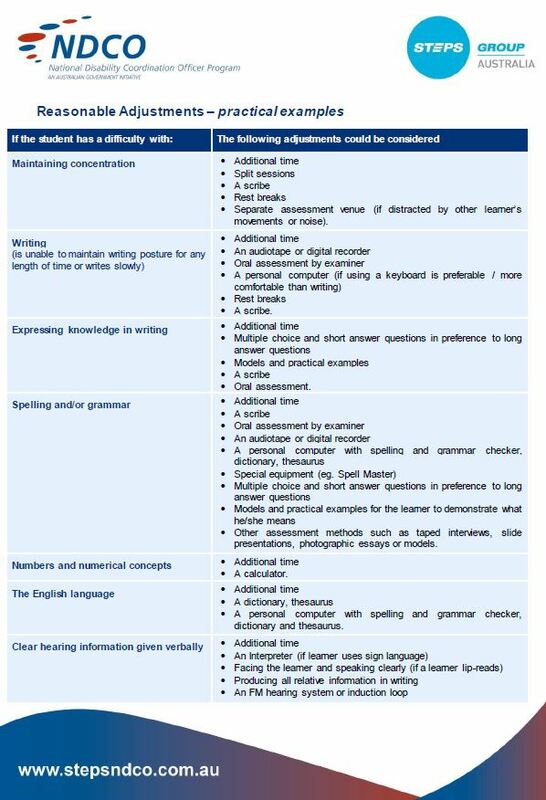 This document demonstrates attainment levels and educational requirements at tier level of study. 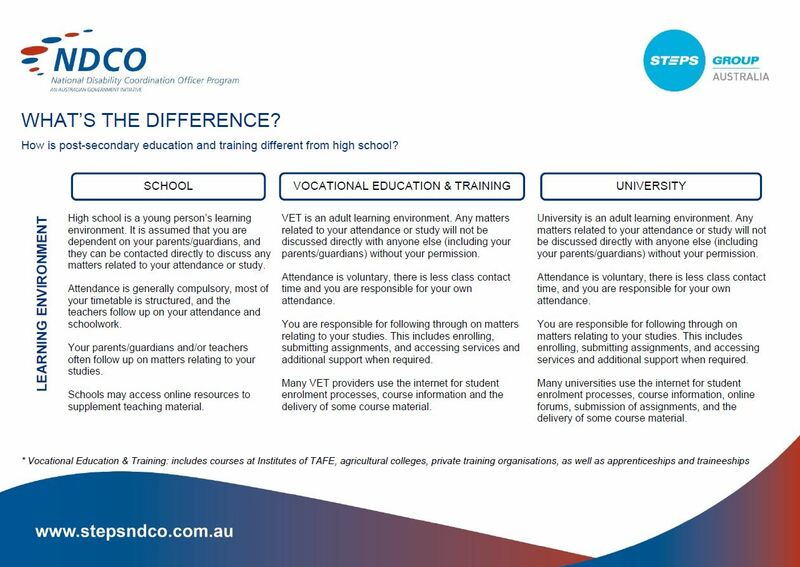 Difference Between School, TAFE and Univesity An overview of the differences you will experience and your responsibilities between School, Vocational and University learning. Inclusive Event and Meeting Checklist Meetings and events are critical for presentation, consultation, sharing information, gaining insights and feedback, and mediation. This checklist provides a simple way to ensure everybody can attend and participate in your event or meeting, irrespective of how formal or informal. 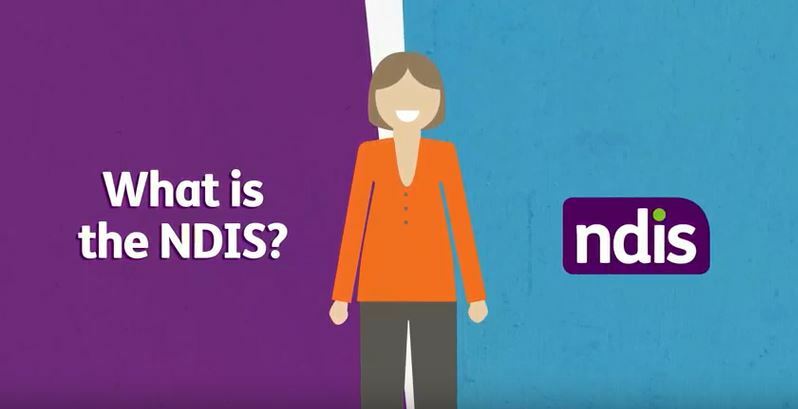 What is the NDIS This video provides an overview of the NDIS. The NDIS is designed to assist people with disability achieve their goals. This may include greater independence, community involvement, employment and improved wellbeing. Education Alliance Queensland Strategic Intent The Education Alliance Queensland will foster seamless education and training transitions for people with disability through collaboration and effective communication. It will create and maintain collaborative and meaningful relationships to enable all educators and support staff to work together to improve successful education and training outcomes for people with disability. Education Alliance Queensland Terms of Reference The Alliance will encourage collaboration and interactions between the education and training sectors across Queensland to improve transition and outcomes for students living with disability. Stakeholders in Queensland will have the opportunity to connect through a virtual platform, to encourage an open environment that is better connected and informed to build capacity and address issues collectively.